See a video of the Proteas giving Ricky Ponting a fitting send-off to the end of his international cricket career. Cape Town – The way seems promisingly clear for Graeme Smith’s increasingly steely South African Test side to nail down their top-ranked status in the world for an extended period. Their rating has been healthily boosted by completing a second successive away series triumph over fierce rivals Australia in Perth on Monday, a result that comes fairly hot on the heels of the equally commendable victory in England a few months ago. The Proteas currently boast a six-point gap over the second-ranked English, who are in the midst of a four-Test series in India but will not make significant inroads into the South African supremacy even if they win the four-Test series currently locked at 1-1. South Africa, for their part, finally have the satisfaction of coming home, in more ways than one, given that their next two series are on our soil, and against teams who have never before prevailed here – New Zealand and Pakistan. The Black Caps will arrive for all forms of combat this month (though the two-Test series only begins at Newlands on January 2) with some renewed credibility after a fighting 1-1 outcome in Sri Lanka, but remain a lowly eighth in the pecking order and will be strongly tipped for defeat, just as the fickle Pakistanis ought to be beyond that. Beating Sri Lanka away has not been achieved by the Proteas since 1993 – there have been three series since with two defeats and a stalemate – but next year’s scheduled series there has been postponed to 2015 anyway. So there is really every opportunity for South Africa, whose Test form on the road has ironically been more impressive than in their natural habitat in recent years, to simply cement their status at the top in the short- to medium-term. While the 1-0 series win Down Under is clearly what counts the most, Smith’s team achieved something at the WACA that no post-isolation South African side had previously managed: win a Test in Australia with a truly dominating performance. You cannot argue with a victory margin of 309 runs. Earlier efforts have primarily been come-from-behind ones, sometimes against massive odds, but here even losing captain Michael Clarke conceded that “South Africa outplayed us for the last four days”. The Proteas will probably be the first to admit, even in the glow of glory, that the compelling action over the course of the three contests was often of a schizophrenic nature, with some pronounced swings in fortune and a really concerted rearguard effort required in Adelaide to save the Test there. That fact alone goes a long way to excusing some of the more fitful tendencies from the South Africans earlier in the series, because the mark of a quality unit is its ability to dominate when it genuinely matters. 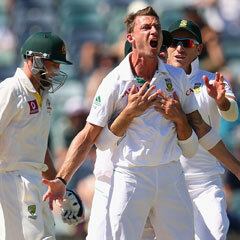 South Africa’s renowned “disciplines” were just so much more evident in the final Test than they had been in Brisbane or Adelaide, particularly on the bowling front where the front-line pace trio of Dale Steyn, Morne Morkel and Vernon Philander roared back as a collective entity after being separated anyway by Philander’s injury-enforced absence from the middle Test. It is worth reflecting, as further indication of a broad sharpening of the act with the ball, that after conceding 23 no-balls in Brisbane and 20 in Adelaide, there was not one further Proteas violation of the “chalk” in the last encounter. A welcome bonus, too, was the performance of left-arm spinner Robin Peterson, reintroduced to Test cricket after a gap of almost five years following the nightmare suffered by leggie Imran Tahir at Adelaide Oval. Peterson bowled with guile and a welcome sense of daring throughout the game, fully deserving his successive three-wicket hauls. His second-innings showing went a long way to knocking the mental stuffing out of the Aussies, considering that he spoiled the Ricky Ponting farewell party and also delightfully coaxed Clarke out his crease for an excellent stumping by AB de Villiers. Peterson took a bit of “tap” as well, but you are always going to expect that when your team has so many runs to play with and the captain has the luxury of keeping his fielders up near the bat for much of the time. He will now be serious favourite, you would think, for the first-choice spinning role against New Zealand over New Year: if you throw in the distant last appearance against Bangladesh at Chittagong in February 2008, Peterson has earned 12 wickets from successive appearances for the Proteas! Of course the rehabilitating JP Duminy will remain sidelined for the rest of the summer, but the splendid arrival of Faf du Plessis as a classy middle-order batting factor means they will manage more than comfortably in his absence, especially with several of the established South African juggernauts still so productive. Meanwhile the “Gary Kirsten effect” as the Proteas’ calm, unflappable coach only gathers impetus. Psst, who is complaining now about that little holiday he allowed his troops after the first Test?